Link to the Custom Packager? Hey there. Long time lurker, first time question asking. I noticed that the keepitfishy links are long gone (and I understand why), but I noticed for the Haromies Project, that means the Custom Packager for the Xbox is now MIA. Is there some place I can still download it? I would love to start playing up some keys and singing in the background. Thanks you all for your time and for everything you all do! My links are fine. Only the d.php links are gone but my files are still there and still accessible from my threads. So, if I am understanding the C3 Tools thread correctly, I would have to take apart every old DLC to give it harmonies/keys/etc, as compared to espher's dummy file? Correct. You can use the Upgrade bundler in C3 CON Tools for this. Drag in the appropriate files from RBHP into the right panel. Well, that bums me out a bit. Well, just means my friend and I will have that customs party we were joking about. Ok, this is a great community, and I am loving getting the customs, but I am super lost in how to get the RBHP files on to my flash drive the right way, I have the C3 tools for customs and the Master Package, but in watching the you tube tutorials I only saw how to add a upgrade to a custom, I mainly just want to upgrade my bought RBN 1.0 songs to pro drums (and I have all the exports so Harmonies and Pro Keys would be great for those too), in the you tube RBHP totorial the input output program the spreadsheet link is broken, I see in the above posts the C3 tool may have something similar but I only saw on the C3 tools you tube tutorial how to combine a custom track and an upgrade for a custom, that's great and all, but how do I get an "output" file for the RBN 1.0 songs, is there a tutorial anywhere or what am I missing? Please help. There are two ways: the cache and dummy method and the baking method. The first one uses the upgrade bundler and has a short build time but a slightly longer install time. Should you ever have to rebuild your cache, you would also need to do this installation again. The baking method puts the upgrades and fixes right into the song files, takes a lot longer to prepare, but you won't ever have to rebuild your cache again. I can upload the my original download of the files you'll need for the cache and dummy method, if you'd like to consider it. For the baking method, as you can see below, you can simply drag the CON file to a song into the left pane of the Upgrade Bundler in C3 CON Tools and all of the upgrade files to the right half and click Bundle! Do that for every song, pack them up if you want (another tool in C3 CON Tools takes care of that) and put them onto your USB drive, and if everything works, you can also transfer them to your internal hard drive on your 360. 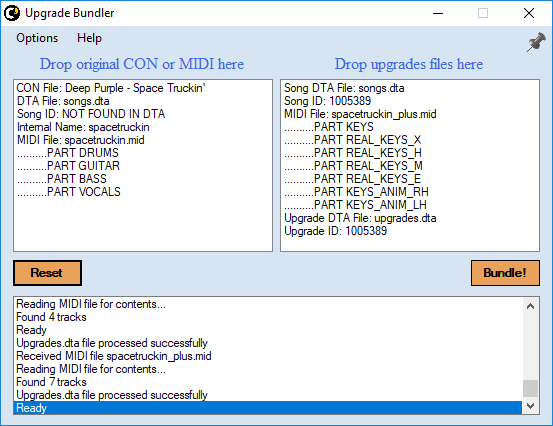 So if I am understanding correctly, you can upload the CON files I need to put in the left part of the bundler (I have to do this one by one for each song it sounds like, which is fine, just verifying), and the Master Package that is in the RBHP spreadsheet has the upgrade file to put in the right part of the bundler, correct? That would be great. If I opt to do the baking method would I need any other files? I assume if I do the baking method then if I add more customs to my flash drive or if I buy official DLC to put on my 360's hard drive then I won't have to rebuild the cache everytime I add another song correct? Is there a step by step anywhere for the baking method that you can point us to? You've got it figured out, you won't need any other files. For songs already in your in-game library, you'll have to delete your cache for any changes to appear in-game. Give it a try - it's not hard at all. What about rb2 export songs with pro keys upgrades? Depack the Export file with C3 CON Tools' Quick Pack Editor, then proceed as usual with the steps above. You'll need to delete your cache at least once. Any additions that require changes in a song's songs.dta file won't be included until the cache is rewritten. I don't understand the cache part. You take it out of the xbox 360, then you delete it. The you put the TU4 and bundled song on you usb, then...? And if I'm Upgrading a rb2 export song, will I not need the rb2 export pack file? or will there be 2 of the same song but one is upgraded and only one song will show up? No need to take it out of your 360, just delete the file and restart the game. That should be enough to let the upgrades show up in-game. It's one of several problematic songs for the bundling process, due to included short version information in the song's songs.dta file. Refer to this thread for a solution.